tableEntryObj = append(tableEntry,content) appends text or a Paragraph object to a table entry. Use the mlreportgen.ppt.Presentation.find method to find the slides that have a Content placeholder. In this case, there are two. Replace the table in the second slide with table1. Table entry to append content to, specified as an mlreportgen.ppt.TableEntry object. Content to append to a table entry, specified as a character vector or one or more mlreportgen.ppt.Paragraph objects. 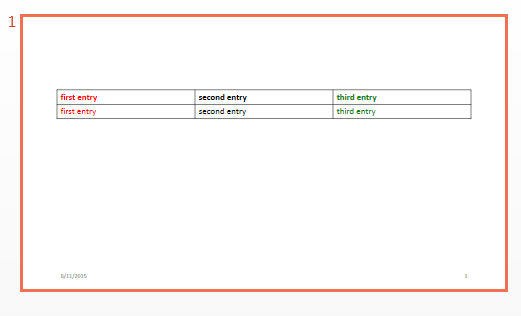 Table entry, returned as an mlreportgen.dom.TableEntry object.